Writers and Books is running this reading group this fall, focusing on a recent book by education historian Diane Ravitch. 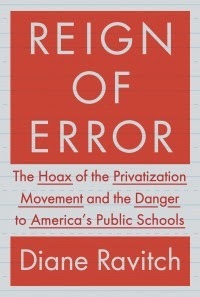 An accomplished historian of education and vigorous critic of what currently passes for education reform in the U.S., Ravitch is extremely provocative in large part because she is relatively conservative and once was an advocate of many of the reforms she now objects to. Her change in mind came from actually looking at the evidence!